In view of Traditional Chinese Medicine(TCM), the occurrence of disease is caused by pathogenic factors which lead to imbalance of yin and yang. Getting cold is due to excessive yin(coldness) or yang(heat) in the body, which cause the lost of yin-yang balance. When the temperature drops suddenly or we are exposed in cold environment, those who have strong healthy qi(immunity) can adjust to adapt the changes of temperature automatically. But those who are not strong enough are easy to be attacked by cold. In this situation there is excessive coldness(yin) in the body. This is cold type cold. 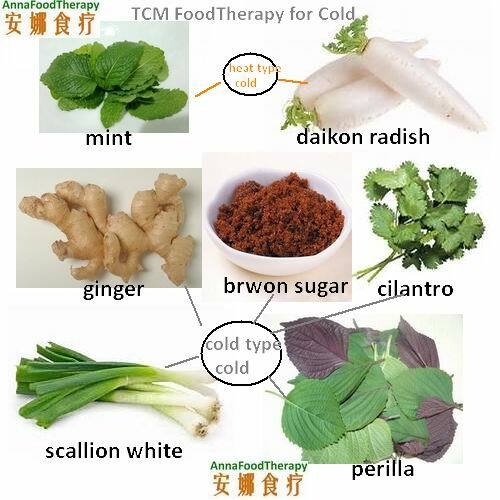 At the beginning the coldness is on the surface of the body, and so it’s very easy to be dispelled by eating foods with hot nature, such as ginger, brown sugar, perilla leaves, or even chicken soup, beef soup, etc. But if you don’t take action at once the cold will develop and evolve and that would be complicated. Heat type colds are caused by excessive heat, which often happen in summer. Daikon Radish and Pear with Brown Sugar Tea. 2.Add mint, turn off heat. Let it rest for 10 minutes. Serve with warm. Drink soup and eat pear and daikon radish. 3 times a day. 1 cup each time. Tip:Add more ginger if you feel cold more. Eat raw daikon radish if you feel hot more. Or you can drink a cup of Ginger Brown Sugar tea in the morning, while eat some daikon radish or pear in the evening. All the foods and recipes listed above are very effective at the early stage of a cold, or even before it happens(you can feel). But it would become complicated if not cured at the beginning. Yin and yang are constantly changing. From Thanksgiving to New Year it’s the happy holiday season. However, many people sneeze and cough thorough all the season. It’s so regretful that we cannot spend valuable times with families or enjoy all the delicious foods because of the cold. Actually we can avoid being attacked by cold with some food therapy knowledge. If you are interested in Chinese character you can read the reason why you get COLD. The Chinese name of “colds” is 感冒（Gan Mao）. Analysis of the character “冒”. The first character 感（Gan）means feeling; the 2nd character 冒(Mao) means excess. What is excess? It’s 目Yin(coldness) or 曰Yang(heat). If we can eliminate the excessive yin or yang in time we won’t be attacked by colds.